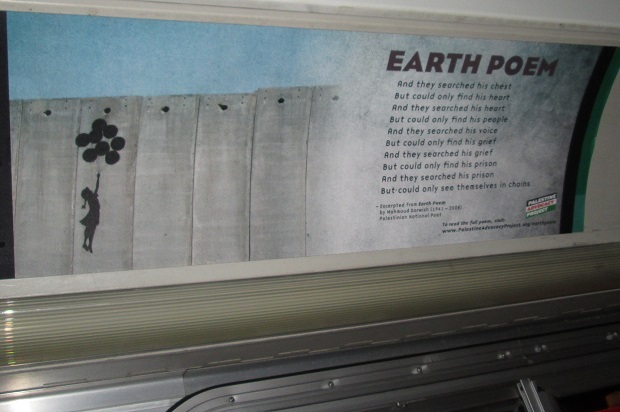 A new ad campaign on California public transportation is getting Americans talking about Palestine, and thinking about the unique role the U.S. plays in the Israeli-Palestinian conflict. Palestine Advocacy Project, a nonprofit organization based in Massachusetts, is highlighting the work of legendary Palestinian poet Mahmoud Darwish in a series of posters on San Francisco MTA buses and trains. 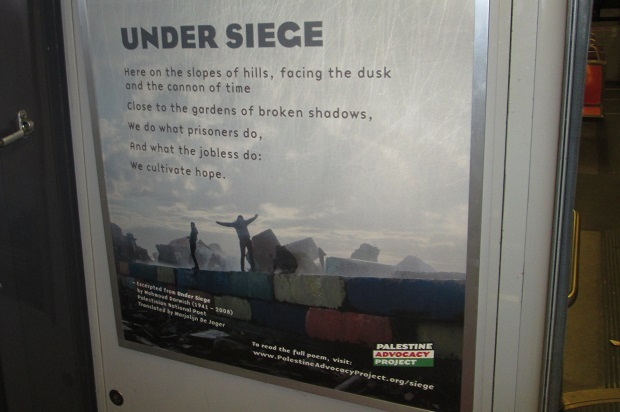 The ads include excerpts from poems like "Under Siege," which describes Palestinian life under Israeli military occupation, which began in violation of international law in 1967. "We do what prisoners do," Darwish writes. "We cultivate hope." "Darwish captures the dual emotions of homesickness and hope that have defined the past several decades of Palestinian popular art," explained Palestine Advocacy Project Board Member Clare Maxwell. "I think a lot of people in the Bay Area will be able to relate." The poems are also accompanied by beautiful photos of quotidian life in Palestine — with images of graffiti on Israel's separation wall, young boys doing flips on a Gaza beach, olive trees and a village home. Jake Chase-Lubitz, the president of the organization, lived in Palestine for several years, where he witnessed firsthand the extreme oppression Palestinians have endured under five decades of Israeli military occupation. Today, he says he tries to do what he can to fight the injustice. Much of Palestine Advocacy Project's past work was "explicitly political," Chase-Lubitz told Salon. "With the poetry campaign, however, we wanted to try to present Palestinian art and culture and encourage people to ask about the political context," he said. "Darwish had an incredible ability to empathize with his oppressor without excusing their behavior," Chase-Lubitz explained. "His anger was potent and unapologetic, but humane and thoughtful. We think that thoughtfulness will move people." "They searched his grief, but could only find his prison," Darwish writes in "Earth Poem." "And they searched his prison, but could only see themselves in chains." Palestine Advocacy Project started in 2013 under the name Ads Against Apartheid. Chase-Lubitz said the group's goal was "to bring information about Palestinians and their struggle for freedom to Americans through public advertising." The organization has popped up several times in the media in the past few years. 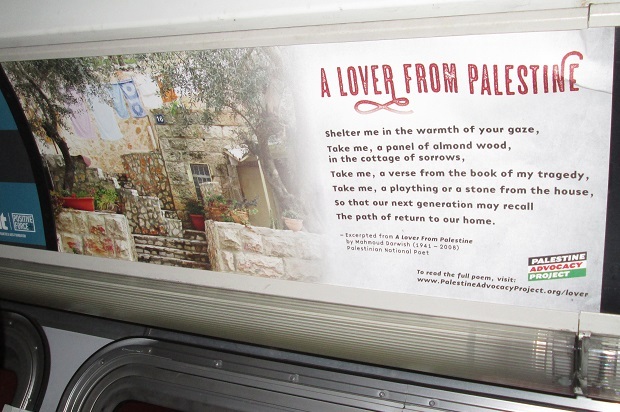 In a national campaign in 2015, Palestine Advocacy Project bought ads on scores of buses, subway stations and billboards in major cities across the country, including New York, Washington, D.C., Los Angeles, Boston and more. These ads highlighted facts about the conflict, with messages like, "Since September 2000, Israel's military has killed an Palestinian every 3 days, using U.S. tax dollars"; or "Israel has built over 150 settlements on land stolen from Palestinians"; or "Israel has destroyed 27,000 Palestinian homes, and created thousands of homeless families, using U.S. tax dollars." The organization draws a lot of attention to the fact that the U.S. government gives $3.1 billion in military aid to Israel every year. Since the illegal military occupation of the Palestinian territories began in 1967, the U.S. has given well over $100 billion tax dollars as unconditional military aid to Israel. Palestinian Advocacy Project has partnered with a variety of other peace groups, including Jewish Voice for Peace, American Muslims for Palestine and CODEPINK. "The controversy our ads created in Boston in November brought the issue great coverage, but they also asked a lot of our audience," the organization's president said. "With this campaign we wanted to give back to people, to give them something beautiful to think about on their way to work." 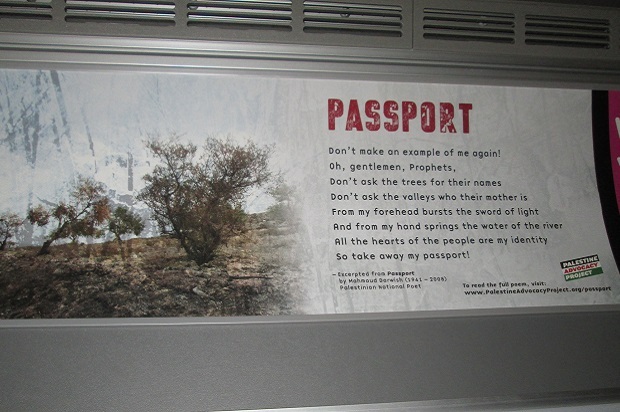 Many symbols of Palestinian dispossession and homelessness recur in Darwish's poetry, such as the passport. "Don't make an example of me again!" Darwish writes in a poem named after the symbol. "All the hearts of the people are my identity. So take away my passport!" Chase-Lubitz thinks Darwish's legendary poetry and the beautiful photographs that accompany it will get people thinking more about Palestine and its unique culture, and remind them that it is not just a place of conflict, but also one of beauty. Darwish's poetry is known for being quite political. He was born in 1941 in Palestine, which at the time was occupied by British colonialists. By 1948, Israel had been established, and the militias that founded the country had violently forced roughly three-fourths of indigenous Palestinians to flee their homes. Much of Darwish's work combined traditional Arab poetry with contemporary political issues, reflecting on a life of conflict and exile. His poems constantly spoke of a yearning to return to a forbidden homeland. "Take me, a verse from the book of my tragedy," Darwish writes in his poem "A Lover from Palestine," "so that our next generation may recall the path of return to our home." Excerpts from some of Darwish's other popular works are included in the San Fransisco ads, such as "To My Mother," "I Belong There" and "Think of Others." All of the featured poems can be read at Palestine Advocacy Project's website. As U.S. taxpayers and as people who have spent a lot of time in Palestine, Chase-Lubitz stressed, "We feel like we have a responsibility to talk about the impact the occupation has on Palestinians."